A German journal devoted to Jewish interests; founded in 1837 by Dr. Ludwig Philippson(1811-89); published first in Leipsic and later in Berlin. At the time of its foundation there had been several Jewish journals in existence: "Sulamith," "Jedidja," Geiger's "Wissenschaftliche Zeitschrift für Jüdische Theologie," and Dr. Höninghaus' "Universal-Kirchenzeitung," which admitted Jewish contributors. Philippson felt that these did not satisfy the needs of the times. He determined to found a journal for the intelligent laity—one that should not only advance the knowledge of the Jews' past history, but should also plead the cause of the Jews of his day. The first number of his paper appeared May 2, 1837, and was published by Baumgärtner in Leipsic with the subtitle "Unparteiisches Organ für Alles Jüdische Interesse in Betreff von Politik, Religion, Literatur, Geschichte, Sprachkunde, und Belletristik" (Impartial Organ for All Matters of Jewish Interest Pertaining to Politics, Religion, Literature, History, Philology, and Belles-lettres). During the first two years three numbers a week appeared; and for a year and a half a supplement was published three times a month, devoted to literature and homiletics. 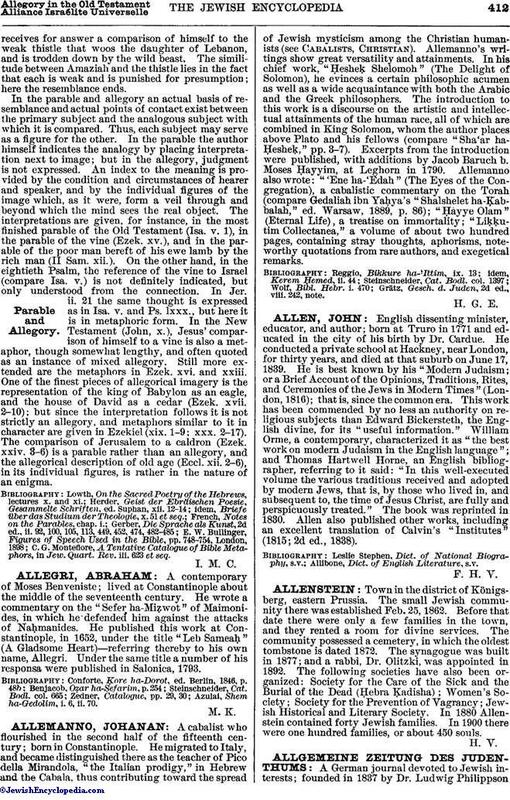 In 1839 the journal became a weekly. The "Allgemeine Zeitung" has never received a subsidy from any Jewish body. 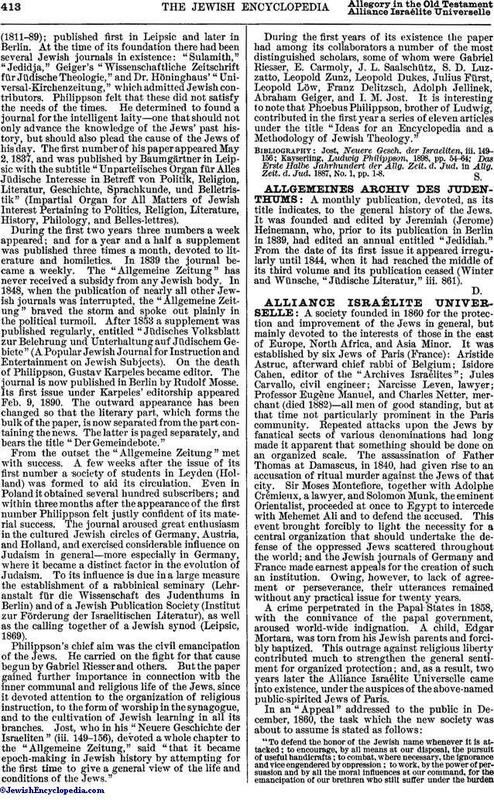 In 1848, when the publication of nearly all other Jewish journals was interrupted, the "Allgemeine Zeitung" braved the storm and spoke out plainly in the political turmoil. After 1853 a supplement was published regularly, entitled "Jüdisches Volksblatt zur Belehrung und Unterhaltung auf Jüdischem Gebiete" (A Popular Jewish Journal for Instruction and Entertainment on Jewish Subjects). On the death of Philippson, Gustav Karpeles became editor. The journal is now published in Berlin by Rudolf Mosse. Its first issue under Karpeles' editorship appeared Feb. 9, 1890. The outward appearance has been changed so that the literary part, which forms the bulk of the paper, is now separated from the part containing the news. The latter is paged separately, and bears the title "Der Gemeindebote." From the outset the "Allgemeine Zeitung" met with success. A few weeks after the issue of its first number a society of students in Leyden (Holland) was formed to aid its circulation. Even in Poland it obtained several hundred subscribers; and within three months after the appearance of the first number Philippson felt justly confident of its material success. The journal aroused great enthusiasm in the cultured Jewish circles of Germany, Austria, and Holland, and exercised considerable influence on Judaism in general—more especially in Germany, where it became a distinct factor in the evolution of Judaism. To its influence is due in a large measure the establishment of a rabbinical seminary (Lehranstalt für die Wissenschaft des Judenthums in Berlin) and of a Jewish Publication Society (Institut zur Förderung der Israelitischen Literatur), as well as the calling together of a Jewish synod (Leipsic, 1869). Philippson's chief aim was the civil emancipation of the Jews. He carried on the fight for that cause begun by Gabriel Riesser and others. But the paper gained further importance in connection with the inner communal and religious life of the Jews, since it devoted attention to the organization of religious instruction, to the form of worship in the synagogue, and to the cultivation of Jewish learning in all its branches. Jost, who in his "Neuere Geschichte der Israeliten" (iii. 149-156), devoted a whole chapter to the "Allgemeine Zeitung," said "that it became epoch-making in Jewish history by attempting for the first time to give a general view of the life and conditions of the Jews." During the first years of its existence the paper had among its collaborators a number of the most distinguished scholars, some of whom were Gabriel Riesser, E. Carmoly, J. L. Saalschütz, S. D. Luzzatto, Leopold Zunz, Leopold Dukes, Julius Fürst, Leopold Löw, Franz Delitzsch, Adolph Jellinek, Abraham Geiger, and I. M. Jost. It is interesting to note that Phoebus Philippson, brother of Ludwig, contributed in the first year a series of eleven articles under the title "Ideas for an Encyclopedia and a Methodology of Jewish Theology." Das Erste Halbe Jahrhundert der Allg. Zeit. d. Jud. in Allg. Zeit. d. Jud. 1887, No. 1, pp. 1-8.